The disease spread from places where there were high concentrations of soldiers. It spread all over the world and took the lives of thirty million people. In the last year of World War I, the world was hit with a flu pandemic, the H1N1 virus. It would prove be the deadliest disease in human history. Far worse in the total number of fatalities than the black death scourges of the Middle Ages or the total number killed in World War I, counting both military and civilian casualties. In less than six months of 1918, thirty million people worldwide died from this flu and most of those who died were young. Many insisted that the total number of deaths was far greater than thirty million. Even worse than the number of deaths was the speed with which it spread and the terrible nature of the illness that people experienced. Common symptoms were severe coughing accompanied with bleeding from different places and the skin turning blue because of the lack of oxygen in the lungs. For large numbers of sufferers, the painful end came within a few hours as their lungs became filled with fluid and they suffocated. Wherever people are crowded together, especially in the terrible conditions of World War I, in frontline trenches or on troop ships from the United States, conditions are ideal for the spread of a flu virus. Because the outbreak occurred at a critical point of the war, when it seemed for a time that German forces might succeed, strict secrecy about the spread of the disease was maintained by American and allied governments. The German government was equally secretive and the post-war publication of documents from that time revealed that the German army was being decimated by flu outbreaks. It was because of this secrecy that the name “Spanish Flu” came to be its popular name. Spain was not involved in the war so they freely reported on their experiences of the flu and, because they were the first to report on it, everyone assumed that it had originated in Spain. Reports of the spread of the disease came in from all over the world. It traveled as quickly as a bushfire to the countries of Europe, to the United States, and to Asia. It is likely that the total number of deaths in Asia, given the high concentrations of people in many regions, was as great as the total number of deaths in Europe and North America combined. In the United States there were half a million deaths from the flu pandemic, all within a period of six months. Most of these were recorded as deaths from pneumonia, the outcome that in most cases led to death. Another half million of soldiers from service in both Europe and the United States were hospitalized and a large number of these died, as many as had died in combat for the whole period of the war. 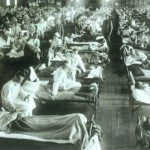 In Britain 200,000 died from the same pandemic flu and, as happened everywhere else, they all died within the same months of 1918 and the beginning of 1919. The course of the disease, just as had been the experience of others with diseases in earlier centuries, was always the same: because the strain of the destructive virus was new, and people therefore had no existing immunity with which to counter it, death rates were high. As immunity was built up among all the sufferers, the death rate decreased and finally reached the low level that is recognized as normal for any flu. In places around the world where population density was very low, and where because of their isolation there had never been exposures to the kind of flu we experience every year, the impacts were devastating. Whole Inuit villages in Northern Canada were wiped out, and on the Island of Samoa in the South Pacific a quarter of the population died. By October, across the United States, as the numbers of dead mounted, a near panic atmosphere appeared. Theaters, movies, bars, and a host of other places were closed down. Even schools, churches, and public campaigns to raise money for the war were shut down. Laws were introduced that required everyone to wear a face mask in public. Stiff fines were imposed on those who sneezed or coughed in public without covering their mouths with handkerchiefs. With our current knowledge of viruses we can conclude that these precautions would not have stopped the spread of the 1918 flu but it was all that seemed possible to people of that time. The Catholic Charities of Philadelphia hired several horse-drawn wagons with which they searched alleys and tenements for the bodies of abandoned victims. The city morgue had no space for the bodies so they had to be placed in mass graves, and without caskets too since Philadelphia, like many cities, had run out of them. Police departments suddenly found their work greatly eased. Crime had dropped to half what it was a few months earlier. The problem was quite different for the generals in charge of the army. This was a time of conscription, not the volunteer army of today, and those in charge of the draft and preliminary training before going overseas had to decide what to do. Field Marshall General Crowder, in charge of the draft and training, was aware that crowded conditions in training camps were a recipe for the rapid spread of the flu. He knew what had happened earlier in 1918 at Camp Funston in Kansas, with the members of the Tenth Division, when soldiers in large numbers fell sick and many of them died. The officer in charge on that occasion wrote to the governor of Kansas, telling him that he had 1,440 admissions to hospital a day, that is to say about one a minute, and asking him to realize the strain that all of this was putting on his nursing and medical staff. General Crowder also knew that several other camps had, more recently, experienced a rash of flu infections. Following consultations with both President Wilson and the army leaders in Europe, Crowder decided to defer the training of 142,000 registrants who were due to begin on October 7, and wait for the end of the flu pandemic before bringing them to camp for training. Settling the question of training camps was easier than the one that President Wilson now faced. The army in Europe wanted more troops in order to capitalize on the successes they were experiencing but medical authorities urged him to stop the mass shipment of troops until the flu abated. Death rates on troop ships were running higher than the numbers that died in battle. Wilson accepted the advice of Army Chief of Staff General March, and decided not to suspend troop shipments. Fortunately, the end of the war came in less than a month after the President’s decision. In 1918 little was known about viruses and almost nothing was available to provide an adequate cure. Almost eighty years later, with concerns mounting that another flu pandemic could hit the world, scientists set about recreating the 1918 virus so that it could be tested out on lab animals to measure its strength. First they had to find a human body that had died as a result of the 1918 flu. They found one in Alaska that had been frozen in the Arctic permafrost soon after death so scientists were able to extract samples of lung tissue from it. The overlapping gene sequences were pieced together from this sample to give the full genome sequence and it was at that point that scientists became fairly certain that some ancestor had originally infected birds and the virus had moved from there into humans. A report from 1918, that was only investigated after 1998, confirmed this conviction. veterinarian who was studying hog cholera in Iowa at that time discovered that the epidemic he was dealing with in pigs had symptoms that were identical to those he observed in the victims of the pandemic flu. He said in his report that whatever was causing the flu in pigs must be very similar to the flu affecting humans. Today, with all our understanding of viruses, experts are convinced that the pandemic flu of 1918 was indeed a mutation of one that had been resident in pigs. When the recently-reconstructed 1918 virus was tested in mice it was found to be extremely virulent, creating 40,000 more particles in a lung than happens with ordinary flu. All the mice that were tested with the 1918 virus died within six days. Samples of the virus are now stored in a secure vault at the Center for Diseases in Atlanta, Georgia, but fears exist over the risk of it getting into terrorist hands. In 2005, the United Nations General Assembly called for immediate international mobilization against an avian flu that had already transferred into humans and, by early 2005, killed sixty-one people in Southeast Asia. There were fears that this virus could become a pandemic and be as destructive as the flu of 1918, a similar bird to human virus and the cause of the deaths of thirty million people worldwide. This new bird to human virus could be worse than the 1918 flu because, while there is much greater knowledge on how to cope with it, there is at the same time far greater and more frequent travel around the world. Finding a vaccine for a new type of virus, one that might change as it moves from bird to human, and then have it available in huge quantities at short notice is a huge challenge. An examination of what happened in Central Africa in the past few years illustrates the problem. Within a year, an outbreak of the deadly Ebola virus took the lives of more than five hundred people in the Congo. The source of the virus was unknown for some time then, in December of 2005, a team of scientists found the virus in three species of fruit bats in the Congo. These bats were part of the human food chain in the Congo and it seemed likely that the transmission from bird to human occurred in this way. The possibility of a similar bird or bat to human transmission in Asia has raised concern everywhere. Especially since the 1918 virus, though unknown at that time, was a transfer from bird to humans. The United States is not the only country that reconstituted the 1918 virus. The director and staff of the U.S. Federation of American Scientists’ Working Group on Biological Weapons are far from being satisfied with the level of security presently provided in Atlanta. They say that the risk of theft by a disgruntled, disturbed, or extremist lab employee at the facility is so great that it comes close to being inevitable. They have proposed raising the level of security to the highest possible. In 2003, they point out, a SARS virus escaped accidentally from a lab in Singapore and a year later there were two escapes of the same virus from labs in Beijing. The avian flu virus was found in thousands of birds in Asia and in smaller numbers in many other countries, presumably carried worldwide by migrating birds. The detailed gene sequences of this virus are well known. It is defined as the virus H5N1 and it is one that has never before been experienced by humans except for those who died from it in Asia. There are therefore no antibodies in humans that could fight off infections from this virus, as is the case year by year when more familiar strains of flu viruses appear. Dr. Andrew Fauci of the U.S. National Institute of Health is the United States watchdog for tracing the behavior of the H5N1 virus, monitoring it regularly as samples are collected from time to time, to check any mutations that develop and to give warning if any evidence of transfers from human to human are found. To date this has not yet happened. Soon after the first human death from H5N1, Fauci’s lab developed a vaccine that would be able to protect humans. It had to be tested out on mice before it was safe to be administered to humans and Fauci discovered that the dosage needed to protect test animals was far greater than required for traditional flu attacks. Thus the various difficulties associated with responding to the United Nations appeal remained: how to produce enough vaccine in a very short time. That is, once the right mutation is present for creating a pandemic, how to cope with breakdowns in social organizations and institutions if large numbers of people die, and how to equip and protect adequately the care givers in hospitals so that the damage can be minimized.